At the end of The Great War, when other regiments were considering erecting monuments to their Fallen, a Royal Scots Officer decided that a Club for all ranks would be the best way to honour the memory of the 11,162 Royal Scots who had been killed. He was Colonel The Lord Henry Scott, younger son of the sixth Duke of Buccleuch.In 1919 he called a meeting of distinguished Scots connected with the Regiment and put his plan to them. As a result the Royal Scots War Memorial Fund was formed, Trustees appointed and a Public Appeal made which yielded £2,000 in the first week, growing subsequently to £17,000. In property values today this is the modern equivalent of about £5 million. In 1921 Nos 30 and 31 Abercromby Place were acquired, No. 29 being bought some years later. 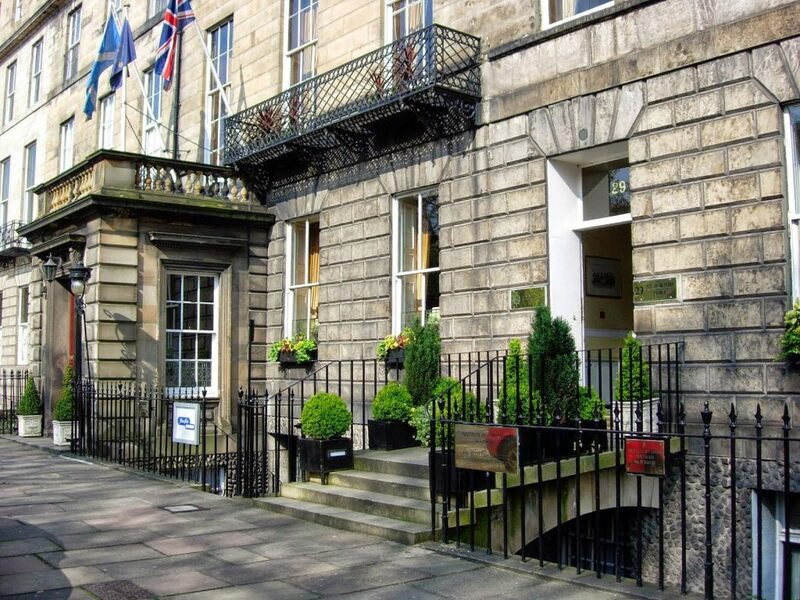 The buildings were then altered and adapted to become The Royal Scots Club. The Hepburn Suite and what was then the Billiards Room were built to the rear of the building in 1929. The Club was a success from the start with Lord Henry as Chairman, an office he held until 1944. After World War II, a second Book of Remembrance was placed in the Memorial Cabinet at the Club Members’ entrance with the names of the 1,231 Members of the Regiment who lost their lives in that conflict. Membership reached its peak in 1946 when there were some 4,540 members but only a decade later numbers began to dwindle as time took its toll on those of the 1914 – 1918 war. In 1957 sons of Members were admitted, then men who had served in any of the Armed Forces and finally the Club become open to anyone duly proposed by a Member. In 1994 the then Chairman of Trustees, Brian Adair, introduced a Management Plan that represented the beginnings of the Club as it is today. A major refurbishment began in 1996 with the development of all of the Club’s bedrooms, meeting rooms and public areas. No. 29 Abercromby Place was re-acquired, converting the ground and supper floors into bedrooms and meeting rooms. The lower floors were converted into a health club and leased to Fitness First, a national operator of health clubs. A membership drive started in 1998, culminating in the Club now having some 1,750 members from all walks of life. In 1999 it was agreed with the Institute of Directors that it should enjoy corporate membership and house its Scottish office in the Club, a lease which lasted to 2016. The former offices now house The Royal Scots Regimental Office. In 2008 Fitness First decided to relinquish its lease. This gave the Trustees the opportunity to incorporate all floors of the Club’s three townhouses into one operation and install a much needed lift, giving equal access to all areas of the building. After a long planning process, permission was granted to build a new bar and lounge for the existing Hepburn Suite, install a lift, convert the original billiard rooms into The Princess Royal Suite with its own Cavern Bar, convert the adjacent Mews Cottage into four hotel-style bedrooms and create modern business facilities.